Library Board members applied for and have been awarded a generous grant from The O’Connor Foundation to begin the rehabilitation of the bathroom and rear exit. The Library has also applied for a substantial grant from the New York State Library Construction Grant Program. Although results of our application won’t be known until next June, it has passed several hurdles and hopefully will be successful. The new entryway and walkway will be located on the west side of the Library, and will not change the beautiful stone steps and grand entryway that we currently enjoy. Since 1931, the Library building has stood proudly on its hill, with its wide inviting stairway welcoming all to visit. Soon we will have an inviting sidewalk as well and a new entrance, to welcome everyone who needs a bit of assistance. 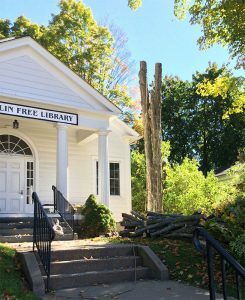 The Franklin Free Library looks forward to improving access for people of all physical abilities so they can make the most of Library resources, attend entertaining and educational programs, enjoy Game Night, and much, much more. Did you know that… The Franklin Free Library provides free wi-fi, internet and computer access to our community?